In the 1990s, California was the nation’s largest producer of alfalfa seed. But because growers relied heavily on honey bees for pollination, there was growing concern about the imminent arrival of Africanized, so-called “killer” bees. These more-aggressive, harder-to-manage bees would require different handling and involved more risk than the more familiar European honey bees, and as such they had the potential to increase alfalfa production costs and possibly reduce yields. A team of UCCE researchers partnered with local growers to study the viability of introducing the alfalfa leafcutting bee as a replacement for honey bees. After three years of data collection and analysis, grower-education field days, and community feedback, the alfalfa leafcutting bee was introduced to commercial fields. 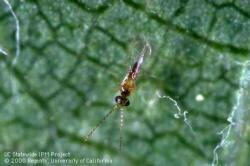 It now plays a crucial role in pollinating California’s alfalfa seed fields. Several growers have reported that if it weren’t for this research and extension work, they would no longer be in business. In the 1970s and 1980s, grape vineyards were commonly treated heavily with insecticides. Even then, the leafhopper remained a very prominent pest—workers regularly complained of leafhopper populations so thick they made it impossible to see during harvest. UCCE responded by introducing and promoting an approach to pest control that relies less on chemicals, the first Integrated Pest Management (IPM) program for grapes. By using popular IPM practices such as beneficial insects and mating disruption in their vineyards, today’s growers are achieving much more effective pest control. Insecticide applications for leafhopper control have become the exception, not the rule. A San Joaquin Valley corn grower noticed distorted growth and burned leaves on some of his plants. In his dogged determination to find its cause, he managed to alienate his seed rep, his pest control adviser, and his herbicide application contractor. UCCE farm advisor Carol Frate saw what was going on and asked if she could do her own research into the cause of the plant injuries. Drawing on her knowledge of soil types, weather patterns, plant growth, herbicides, and more, she was able to find the surprising cause: hot, sandy soil was being thrown upward during cultivation, scorching the younger cornstalks. By accurately identify the cause, she was able to assure all parties that there would be no long-lasting impacts and that nearly all of the affected plants would survive. By applying scientific principles and her own knowledge, Carol was able to repair hard feelings among business associates, and perhaps even avert a lawsuit. The growth of the environmental movement in the 1960s and 70s meant that pesticide use was showing up more and more on the public radar. UCCE was looking more closely at pest control practices, too, and developing new integrated pest management (IPM) systems. IPM is a more environmentally sensitive approach to pest management that looks at whole systems and focuses on commonsense practices. One of UCCE’s early IPM success stories was in cotton. UCCE specialists and advisors partnered with Agriculture Experiment Station faculty at UC campuses to develop a cotton IPM program that emphasized cultural and biological control methods. 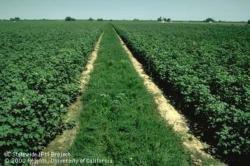 Today most of California cotton industry uses an IPM program and is far less reliant on chemical pesticide use. Andy is a Central Coast cherry grower. In May 2009, he brought samples of cherries infested with a maggot to show UCCE farm advisor Bill Coates. Coates quickly saw that this was an unfamiliar pest that could pose a serious threat to the local cherry industry. He sent the samples to the California Department of Food and Agriculture for expedited identification, and immediately began to work on a monitoring and control program based those he had used for fruit flies. Because this was a previously unknown pest with a sudden onset, the pest—identified as the spotted wing drosophila—caused significant crop damage that first year in many Central Coast cherry orchards. But thanks to the efforts of Bill Coates and other UCCE specialists and advisors, just a few short years later the industry had a robust commercial monitoring program and good pest control measures in place. 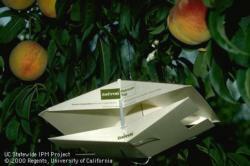 As health concerns about pesticide use grew in the 1980s, several UCCE advisors and specialists began to look at new ways to control pests without the use of chemicals. This group was the first to look at disruption of a pest’s mating system as a way to prevent the pest from breeding. The first commercial orchard to implement this control method was a Merced County peach orchard under the supervision of two UCCE advisors. The method has since become so popular that today it is foundational for organic growers and is a core component of any Integrated Pest Management (IPM) program. Sweetpotato seeds in the early 1960s commonly carried feathery mottle virus, the cause of russet crack disease. In 1961, UCCE farm advisor Bob Scheuerman and specialist Dennis Hall began to test seeds for the virus and plant only clean seeds in their trial plots. By 1966 they were able to see significant increases in yield. Their testing and sorting methods are still used by growers today, and have contributed to increasing yields in California from 5 tons per acre in 1967 to 16.3 tons in 2009. Scheuerman and Hall’s seed tests are now used throughout California and in other states, helping provide more consistent, higher-quality sweetpotatoes for the market. In the 1980s, the California black-eyed pea industry was in jeopardy. 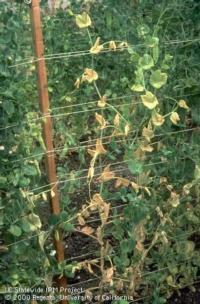 More and more plants were being hit by Fusarium wilt, a disease that leads to premature yellowing and aging. In response, a team of UCCE farm advisors and UC plant breeders worked with growers to develop CB 46, a black-eyed pea variety that is resistant to the disease. The new variety grew so well that it became the standard for the black-eyed pea industry, and still is today, 25 years later.